Trader Joe's Organic Coconut Milk & Other Coconut Products - Kosher for Passover without Special P Hechsher! 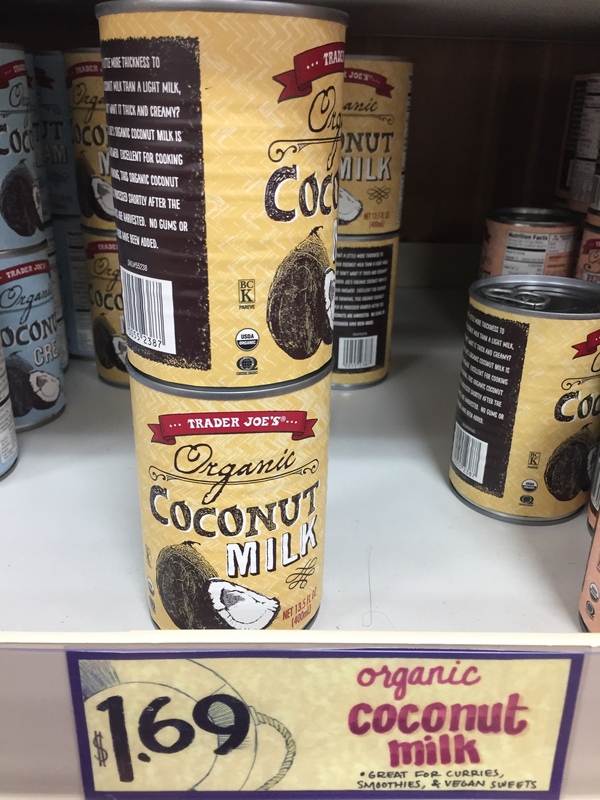 Trader Joe’s Organic Coconut Milk & Other Coconut Products – Kosher for Passover without Special P Hechsher! Wow! KosherCheck (formerly BCK) is my favorite kashering organization EVER! They are incredibly responsive and kind. I reached out to them after this post went viral and got verbal confirmation that this product IS permitted without a P. I then asked if it was possible to get that in writing – because so many of you have asked for confirmation. Ask and ye shall receive! Well, this is very exciting news! Trader Joe’s Organic Coconut Milk (canned) and Reduced Fat Organic Coconut Milk (canned) are both kosher for Passover when bearing the Kosher Check hechsher. They do not require a special P hechsher. I popped into my Trader Joe’s this evening for a quick price check – and found that it’s just $1.69 per can. What a bargain!!! I’d love to know what your favorite recipes are for coconut milk. I use it to make creamy soups and Indian-flavored stews all the time. And the cream part that sets up at the top of the can is supposed to be great for whipping. P.S. For those who have asked, I’m also working on the official word from the OU et al on coconut oil this year. Very cool! Is it only the reduced fat as pictured? Debbie – I swapped out the image, I’m sorry – this is actually for the regular (not the low fat), as far as I know! That is good news, Mara. Thank you. I use the regular when using canned coconut milk. I’m excited! So it’s not for the reduced fat (which has a BC K)? See below – but it’s actually for both of them! I looked in the OU Passover Guide and did not find this. I sent an email to the OU to verify. thank you for the info & the link (my mistake–I thought TJs coconut milk was under OU). But, I did not see the coconut milk listed as being K for P without P designation. Do you have the info directly from KosherCheck? Can you post it please? No that I don’t trust Nava, it’s just that I like to verify. I just got off the phone with Richard Wood of Kosher Check in Canada. He suggested I post his phone number: 604-716-2770. All coconut milk, coconut butter and coconut oil products at Trader Joe’s with the Kosher Check symbol, BcK, are kosher for Pesach without additional certification. Definitely call if you want to double check and confirm. According to the CRC this is a “recommended” hechsher. Chocolate mousse! Put can in fridge overnight. Open can and take out solid part only. Melt in pot with chocolate chips. Put in bowl or individual cups. Pave in fridge until firm. So excited to make this on Pesach! Thanks for the info. I do the same thing, however I first chill the coconut milk in the can overnight and then whip it with a Kitchen Aid the next day. Melt one cup of chocolate chips. Add the whipped coconut milk into the melted chocolate chips — and you have delicious chocolate mousse! Wow, this sounds awesome! I have a pretty restricted diet for health reasons, but this sounds like the perfect craving crusher. Just came back from our Trader Joes’. It’s a bit farther than I usually drive for shopping, but always has good stuff. They were all out of the coconut Milk, so I got coconut cream. Same ingredients, same heksher. Based on the above comments, that makes it ok, as I understand. Wish I had known about the coconut butter! I’ll just make my own. I’m wondering if the Spectrum coconut oil is still good this year… I’ll call the OU if no one has yet. Just called OU. Spectrum Coconut Oil is fine for Passover without the P.
Any word on whether the Trader Joes’s Coconut Milk can be used for Pesach this year too? I was wondering the same. I’ll call the number above. Just spoke with him it is good for pesach!! !